Northend U9s Pumas who played in the Irish FA Small Sided Games Tournament at the Showgrounds on Saturday morning. Davy Wylie’s Northend United U13 team came up against Hillsborough on Saturday and although losing narrowly, put in a good display. Elsewhere there was a good performance from the U16s ,who lost a close match against Irish League Academy side, Carrick Rangers, 4-2 after hitting the crossbar and having one cleared off the goal-line in the closing minutes. The U11s were again the day’s top goalscorer, beating Hillsborough Juniors 4-2, while the U12s United’s team’s defensive frailties let them down in their match against Newhill, conceding goals early in the match, and despite a spirited 2nd half fight-back, couldn’t get a share of the points. The U14s and U15s both lost against Downpatrick and Lurgan Town respectively, while the U17s had no match this week. Northend United 4, Hillsborough Juniors 2: Northend ran out worthy winners thanks to another hat-trick from the prolific Jay Mckeown, while Billy Bell was also on target. Northend United 4, Newhill 6: This was very much a game of two halves as the Ballymena boys trailed 6-1 at the break before storming back in the second period. The Northend goals came from Tyrone Mitchell (2), Kevin COsgrove and Callum McMurray. Northend: S McDowell, D McKay, J Adams, D Magill, K Cosgrove, T Mitchell, O Campbell, K Barr, L Hector, C McMurray, Peter Bristow. Draperstown Celtic 3, Northend United 1: Northend couldn’t build on the lead given to them by Ciaran Martin’s super strike as the mid-Ulster side battled back to win. Northend United 1, Hillsborough 4: aAgainst the league leaders, Northend got off to a bad start, conceding in the first minute. Northend did equalise through Patrick Ferris, his pace took him away from the Hillsborough defence and he found the net. The second half started as the first with Northend conceding a sloppy goal just after the kick off, leaving the score 1-2. The Blues midfield was struggling to hold onto the ball and Northend’s strikers did not offer much relief. Patrick Ferris had at least two more opportunities to equalise breaking free from the defenders but just couldn’t beat the on-form Hillsborough keeper. Northend battled really hard for the rest of the game but gave away another 2 soft goals before the final whistle. This was a much tighter game than the score ended up. Northend: C Higgins, J Morrow, H Wylie, J Montgomery, R McKillop, C Campbell, C McGaughey, C Richmond, P Ferris, R McQuillan, J Casey, A Caulfield, A Campbell. 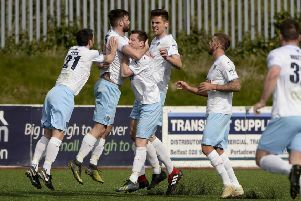 Carrick Rangers 4, Wakehurst 2: With Wakehurst missing four regulars and up against a very good Carrick side this turned out to be a really entertaining game. It was Carrick who went in front controversially with the referee giving a harsh penalty for hand ball, and within five minutes awarded the home team another spot kick for a tackle inside the box which was also converted. Carrick looked to have ended the game as a contest when they went 3-0 up from a corner but Wakehurst never let their heads drop and deservedly got a goal back through a brave Ronan Laverty header. This really spurred the Ballymena side on and they were really turning the screw with Dobbin hitting the crossbar and Laverty missing a chance at the back post. With 15 minutes left Wakehurst got another back and what a goal it was, Declan Dobbin winning the ball back in his own box before setting off on a mazy run beating 3 players a sliding a lovely ball through to Matthew Erwin who from 25 yards hit an unstoppable shot into the top corner. With Wakehurst pushing for the equaliser they got caught with a sucker punch to leave Carrick 4-2 winners. The first of this season’s Club fundraising efforts is the annual Family Quiz Night which is being held at the Michelin Club on Thursday 29th October, commencing at 7.00pm sharp.